Separate self adhesive stainlesss steel plate for branding. Aluminium carry case. 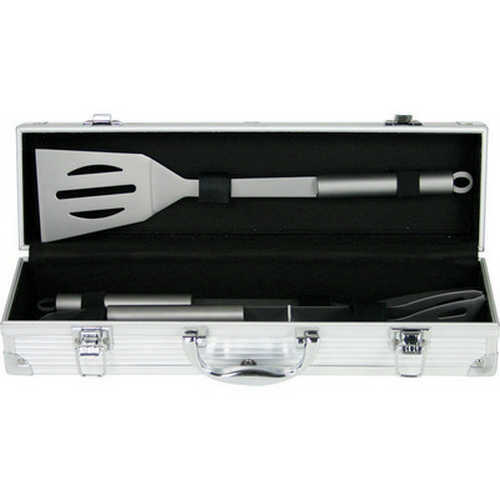 Stainless Steel Tongs, Fork and Spatula with satin finish. Product Size: 370 x 95 x 80mm. Product Packing: Boxed. Decoration Size: 25 x 60mm. Decoration Position: Branding Plate, Tool Handles. Decoration Method: Pad Print | Laser Printing. Carton Quantities: 12. Carton Size: 40 x 38 x 37. Carton Weight: 14. Colour: Silver. Price includes: See drop down menu for decoration options.